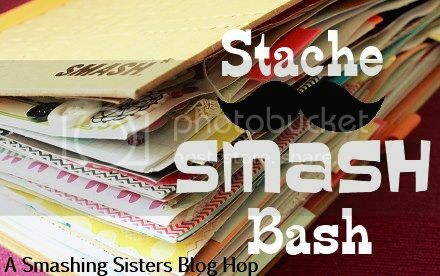 Angie Delarie: STACHE SMASH BASH! This is our second Blog Hop and if you adventured from Karyn's you are following instructions well! I personally have really had nothing to do with moustaches before this blog hop. I saw them on pages...and thought, hoe could I use them, well not today! This digi all started with a quick email from Lizzie and a couple of hours drawing session that produced this stunny but dashing gentleman from the earlier year! 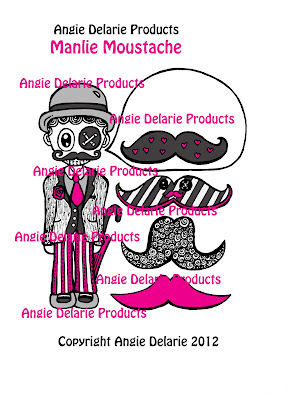 For participating in the blog hop, you will have a chance to win a $20 gift certificate from my Etsy Shop AND the new Mustache digi from Angie Delarie! The drawing will end 10/17 at noon (PST – Pacific Standard Time). Good luck everyone! I have seen them made with pink chocolate mould's as well! Angie, fabulous as usual! I personally love mustaches and you have outdone yourself! Love him and all his staches! These are cute staches and would be perfect for the smash pages about my 2 year old boy. He's had some fuzz on his lip since he was born and we always make fun of it... lol. P.S. I can't see what smash page. these new stache images are so fun! I really enjoyed using them on my pages!! Your digi's are so adorable! You are incredibly talented! I also cannot see your pages, but thank you for sharing your digi ;). Awesome images! Love the 'stache trend These would be perfect embellishments for a layout or smash page. I have photos from a family reunion that need scrapped and the older brother and sisters took pictures with mustaches and/or lips! Thank you for sharing. Cute digis! I would use these on a smash page about my dad or grandpa. I can't see your smash pages! Thanks for the hop though! They are fantastic Angie and I would have to use them on pages about my hubby, two boys and our cat!